Here in South Carolina, when the nights get longer and the temperatures begin dropping, that means it’s oyster season! If you live along the coast, or like to visit, you know that oyster roasts are as integral to fall as football, fairs, harvest moons, and the coming holidays. This is why, on a recent roadtrip to Beaufort County, SCIWAY had to visit the Bluffton Oyster Company. 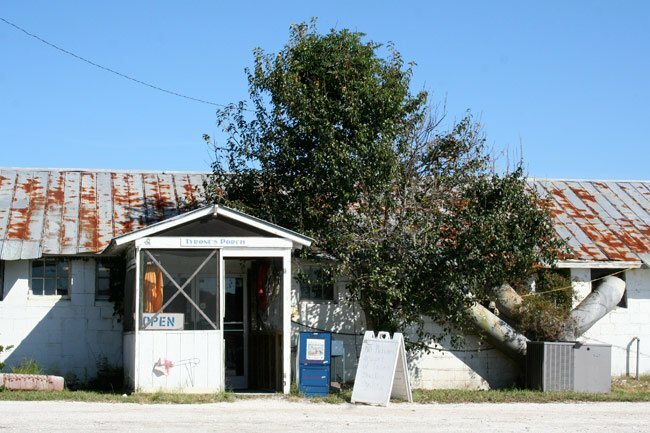 Located on the May River, it’s the oldest oyster factory in our state – operated today by the grandson of the original owner. Take a look through our photos below to see scenes from this popular seafood company that still operates much like it did 100 years ago. Here, you can see men working on the dock and sorting through the day’s catch. 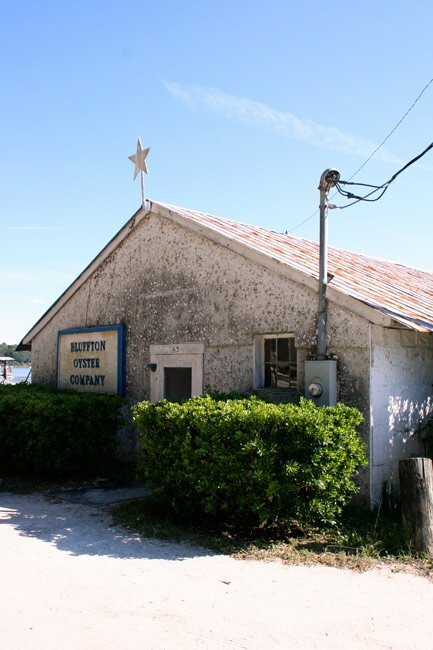 The Bluffton Oyster Company employs experienced shuckers to separate its famed May River oyster meat from the shells. Inside, workers will expertly remove the oyster meat with speed and precision. A fast shucker can potentially work through two bushels of “shell stock” for a gallon of raw oysters, and shuck 7 to 9 gallons a day! 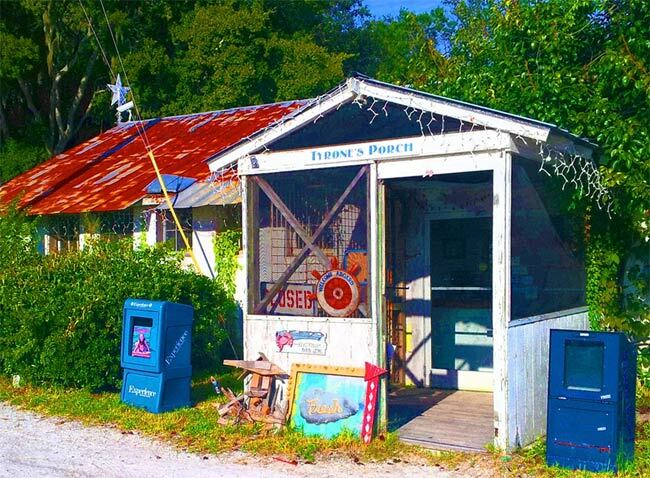 Tyrone’s Porch, pictured here, was built as a memorial to Tyrone Smith, a young oysterman who tragically lost his life while collecting oysters for the company. 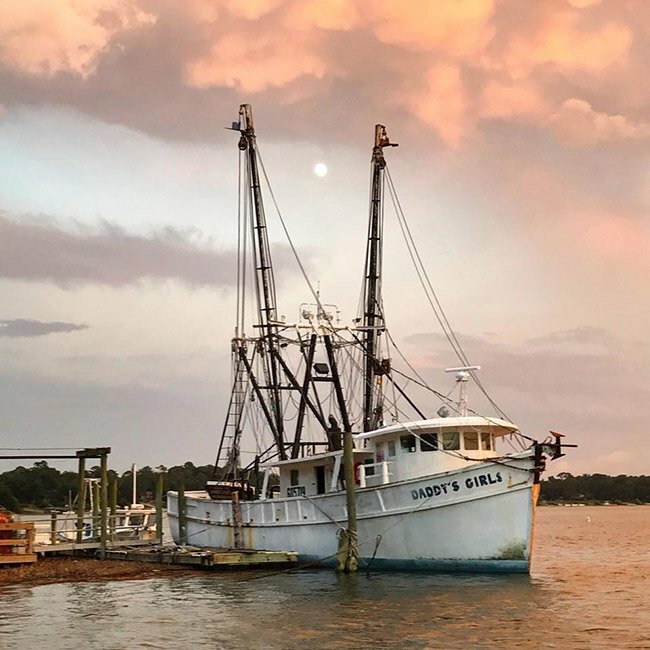 Tides run high during much of South Carolina’s oyster season, when the winds and temperatures can be biting – especially during the cold winter months of November through March. Oystermen plod through thick mud and frigid waters searching for the razor-sharp shellfish. The conditions can be dangerous at times, but most pickers are highly experienced, and many have been oystering for much of their lives. Many people may not know that South Carolina was once home to a thriving, world-famous oyster industry. 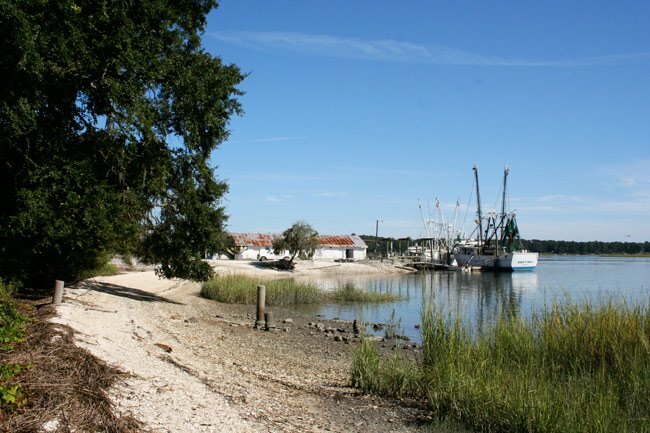 Before World War II, oyster canneries (or “factories”) lined South Carolina’s coast, from Daufuskie Island, Bluffton, and Port Royal, all the way up to Litchfield and Little River. At least 3,500 people worked in these factories during their heyday – mainly Polish immigrants and African-Americans. Oyster pickers (men who pulled oysters from the mud) and shuckers (known as “the women with the iron fists”) worked hard for far less than anything resembling a minimum wage. Pickers, who worked around the rise and fall of the tides during the coldest months of the year, often labored by moonlight, then fell asleep on their boats. To reach the oysters, they slogged through thick pluff mud and bent over for hours on end while swinging heavy culling hammers to break razor-sharp shells from beds of cultch. Back at the factories, women stood on sloped concrete floors in rooms kept as cold as refrigerators. A fast shucker could work through two bushels of “shell stock” for a gallon of raw oysters and shuck 5-9 gallons a day. (The amount depended on whether it was early or late in the season, which determined the amount of meat inside the shells). This meat was canned under such labels as “Daufuskie” and shipped all over the United States and Europe, where they were considered delicacies. South Carolina’s oyster industry was hit hard in the middle of the 20th century, with many factors contributing to its decline. For starters, a typhoid scare broke out when raw sewage contaminated a batch of New York oysters. Oyster consumption dropped everywhere because the public did not understand other areas weren’t affected, or that the heat of the normal canning process would eliminate this risk. For factory owners, however, the fear of typhoid was a minor threat compared to new wage and hour-limit laws. While providing much needed protection for workers, these forces undermined the profitability of the canneries and forced closures up and down South Carolina’s coast. Then, as the Lowcountry economy became more focused on tourism, many people left the oyster industry to work in resorts where the pay was better and the conditions were less demanding. The supply of the oysters themselves also declined. This was due largely to pollution and a loss of cultch. The environmental impacts of industries (such as paper mills) and big new housing developments both took a heavy toll on our coastal water quality. Oyster beds were contaminated and closed. Finally, inexpensive oysters from Asia became widely available. In fact, an Asian company now owns the famous Daufuskie brand name. These days, South Carolina’s contact with oysters is largely confined to backyard roasts and the occasional festival. Most of these festivals don’t serve local oysters, however. There are no longer enough healthy beds in our creeks to supply the demand, so oysters are trucked in from the Gulf Coast. There are two main causes for this scarcity. As mentioned above, where beds do exist, they’re often polluted. South Carolina’s Department of Natural Resources is regularly forced to close beds because of poor water quality. If monitoring indicates water quality has improved, the beds are opened again, but over the last 20 years about a third of our state’s 3,000 acres of oyster beds have been closed to shellfishing. The second problem is that so many oyster shells taken from our waterways are never returned. Too often, shells leftover from church suppers, election stumps, fundraisers, and by-the bushel retail sales end up in driveways and landfills – not back in the estuaries where they belong. These old shells are the ideal place for new oysters to attach themselves and grow and without this habitat, many oysters don’t survive. A recent report by the Nature Conservancy shows that in Charleston County, 50-90% of all oyster beds have been lost in the past 100 years. The Nature Conservancy and DNR both have ongoing programs to create artificial reefs and restore natural oyster beds with recycled shells. The recent recession has cut into their budgets and threatened these efforts, but there has been some success in obtaining grants for innovative approaches to saving shellfish beds. For example, restaurants use the majority of our oysters, but there has never been a concerted effort to recycle their discarded shells. New funding from the US Fish and Wildlife Service will jump-start a program to coordinate this, and restaurants are already signing up to participate. If you love your oysters, please recycle those shells! DNR has a great program to help, and our Lowcountry tradition can’t survive unless we pitch in! 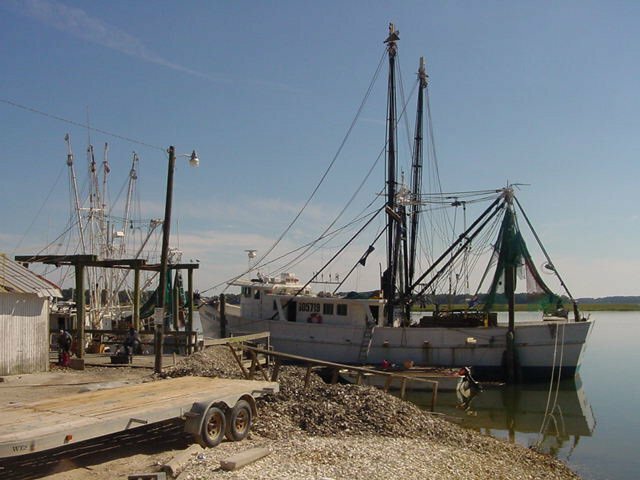 * The typhoid scare occurred in the mid-1920s, but its effects were lingering, and it is considered the beginning of the end for South Carolina’s oyster canneries. See SCIWAY’s video of the Bluffton Oyster Company. 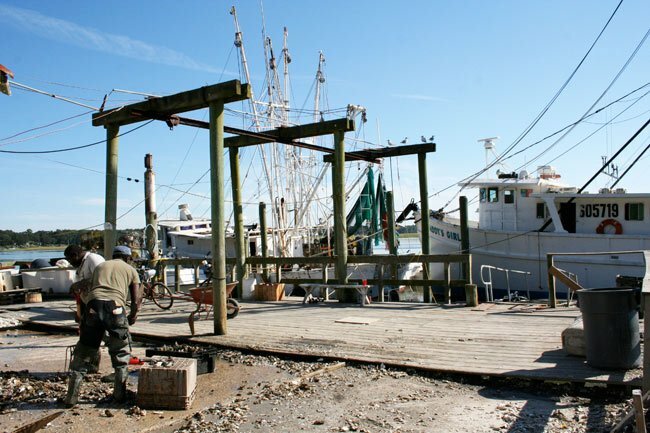 Visit our guide to SC oyster reef restoration, with photos and descriptions. Be sure to check out the SC oyster guide too. It includes photos, delicious recipes, fun festivals, oyster shell recycling information, and much more. I am interested in attempting to obtain a May River oyster can as a Christmas gift. Can you give me any collectible shops or anyone that may have one to sell? Thank you in advance for any help you may be able to offer. Which restaurants in Bluffton, Hilton Head, or Charleston serve May River Oysters? I love them. They are the caviar of oysters. I have been eating oysters for the past 50 years and I have eaten oysters from Key West, all along the east coast and up in to Canada. In my opinion, Bluffton oysters are the best on the east coast. Try them – if you eat oysters you will get hooked on Bluffton oysters like I did fifty years ago. The reason most people don’t go first class is they have never been there! Bluffton oysters are always first class.